Former Cleveland Cavaliers point guard Kyrie Irving has certainly received some criticism for requesting a trade from the Cavs this offseason. Many wondered why Irving would want to play on any other team considering the fact that he had just gone to his third straight NBA Finals and got to take the court with LeBron James every night. 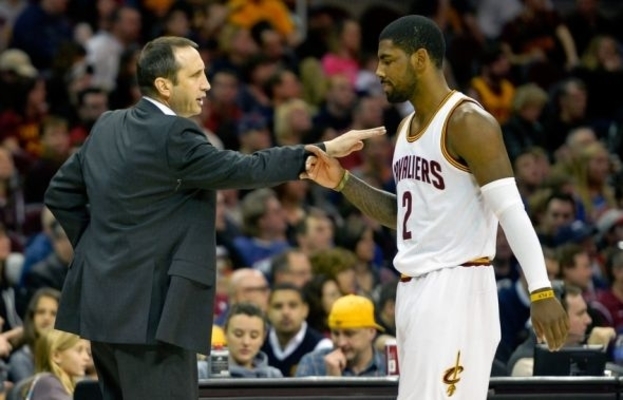 For former Cavaliers head coach David Blatt, however, the news that Irving wanted out of Cleveland was far from a surprise. Blatt spoke with the Boston Herald‘s Mark Murphy last week and according to him, Irving’s departure from Cleveland was a long time coming. In fact, Blatt thinks the writing was on the wall back when he took the Cavs head coaching job during the summer of 2014. He went on to praise Irving, calling his decision to pursue that happiness that he had been missing a brave one. Blatt, who currently coaches the Turkish team Darussafaka Dogus, continued to explain why he believes the talented point guard ultimately decided to request the trade. He added that the news of Irving’s request did not surprise him. The way Blatt sees it, the fulfillment has come now that young All-Star is the true leader of his own team and not playing second fiddle to James in Cleveland. “Ky is (now) the top dog, top of the totem pole, and he’s reveling in that,” he said. “Also incredible is the fact that he’s playing in a winning program. It’s up to him to do whatever it takes from here. So far the move has worked out quite well for Irving. He is currently averaging 24.7 points and 4.9 assists per game on a young and talented Boston Celtics team that has enjoyed a 26-8 record despite being without one of its most talented players, Gordon Hayward. While the Cavs’ 23-9 record is quite the achievement as well, Cleveland has definitely gone through its fair share of growing pains as a result of Irving’s departure. There isn’t much left to say that hasn’t already been said about Irving’s decision to leave the Cavaliers. He was once a hero in Cleveland, but now he is one of the few players in the Eastern Conference who could truly stand in the way of James and the Cavs reaching their fourth straight NBA Finals. Both the Cavs and the Celtics seem as though they are on a collision course to meet in this season’s Eastern Conference Finals. Given the way both stars and teams are playing at the moment, the series could be one for the history books.